As we kick off the new year, development in the eCommerce space is stronger than ever and the open-source platforms available pack some serious punch. The fact that eBay moved so fast mid-last year to pick up the remaining 51% stake inMagento, after dishing out $2.4B for GSI Commerce (used by Adidas, NFLShop, Toys ‘R Us, RadioShack, Timberland) is testament to this claim. For someone new to the eCommerce and shopping cart system, choosing the right open source platform for your online store can be a daunting task. This Magento vs OpenCart compare should help with the process. Though loads of feature-rich solutions are already available catering to a range of different business needs, the “old dogs” in the game (OSCommerce, ZenCart, X-Cart and the like) are quickly being left behind by the rise of more powerful, robust, secure and scalable solutions like Magento and OpenCart. Magento was founded in 2001 and officially launched in March 2008 by software company Varien. In the last few years, it has become a big hit for developers looking to move away from osCommerce, ZenCart and other poorly structured systems with outdated and buggy design/code (reminiscent of the PHPNuke days, which was quickly tossed aside with the arrival of Joomla, WordPress and Drupal). Today, it serves more than 110,000 merchants worldwide and leverages off a large community of third-party developers and solution partners. Technical Support: Enterprise clients receive top-notch multi-lingual 24/7 support across the globe. Community Support: With a professional, established developer community and over 60,000 online merchants powered by Magento; finding support for common setup/configuration as well as advanced coding issues is never too far away. Advanced SEO/SEF functionality out-of-the-box (well formed XHTML source code and optimized URLs). Advanced API (SOAP) functionality – System is very flexible due to modularity and independence of core with separation between core and user modules. This makes it the best choice for integrating shopping cart functionality alongside existing ERP, CRM or Accounting business systems. Powerful multi-store/site features: Offer products/services globally across multiple sites and vendors. Allows you to create and manage multiple storefronts from the one centralised admin dashboard. Lack of “newbie proof” technical documentation and complicated/abstract coding styles makes it a hard solution to pick up and customise/modify out-of-the-box. Inexperienced coders can expect to spend solid weeks (or months) to feel moderately comfortable with the inner-workings of Magento. Maintenance: Requires decent server-side knowledge of caching and mysql optimizing, because it is very huge and resource-dependent. Expect to dish out substantially more in server costs/maintenance development costs as the store grows and is extended beyond the default shop setup. Installation: First time install success is rare for new Magento users/coders. Expect to spend considerable time fixing installation dependencies or looking for a web host that can handle it. Magento often gets branded as “bloatware” due to its sheer size (an out-of-the-box setup is around 100MB vs. OpenCart: 20MB) and dependencies. Hosting Costs: Magento is an eCommerce powerhouse designed to handle thousands of products across multiple stores/sites with high-traffic. Even for a small store with around 50-100 products, your typical shared/cloud hosting service isn’t going to cut it. To be on the safe side, you’ll want a VPS or dedicated server lots of RAM and decent processing power. Uncertainty: eBay plans to operate the Magento platform separately while they look at additional ways to fully integrate Magento into eBay Inc.’s X.Commerce platform. Where will this leave Magento later down the track? OpenCart launched in late February 2009 by independent developer Daniel Kerr; and has since gained traction amongst developers to be one of the best solutions for small-to-medium online stores. OpenCart calls itself a “turn-key ready” (or out-of-the-box) shopping cart solution – after installing, selecting a template and adding products; you’re ready to start processing orders in no time. Easy Installation: The 4-step Installation process is a breeze due to looser system requirements/dependencies (apart from the usual PHP/MySQL essentials). Out of the box, this is by far one the easiest platform to install, configure and wrap your head around. Fast and light-weight: The front and back-end facilities are much faster than most shopping cart systems and server load/resource usage is substantially lower to that of Magento and other shopping carts. Built on a scalable MVC (Model, View, Controller) framework with clear coding logic; making it by far the easiest out-of-the-box eCommerce store for a budding freelance coder to pick up and customise. Administration: Sleek, fast-loading and user-friendly administration interface. Impressive analytics and reporting functionality. Intuitive Templating System: Much easier to skin and customize (doesn’t utilise the much-feared Smarty Template Engine). Additionally, if something breaks or a file goes missing in your custom template, OpenCart will roll back to default to avoid downtime. Commerically developed templates, plugins and addons are considerably cheaper than Magento. Some core functions don’t work as well as advertised; OpenCart community members blame this on the closed independent development environment. Regardless, if you take a peek at the OpenCart development/release cycle – bug fixes and extended features are very frequent. SEO: Many users experience trouble using the built in SEO/SEF functions – most developers resort to third-party addons or hacking the core SEO functions. This is however, being worked on for near-future releases. 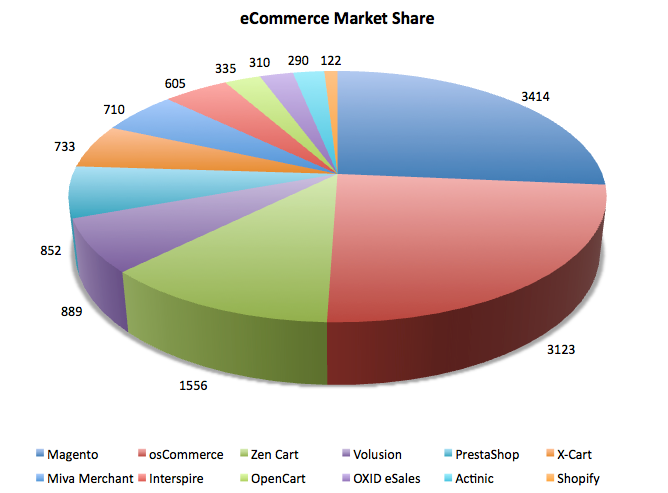 Smaller developer community than Magento; however it’s only a matter of time. Magento: For the large, established business with thousands of products anticipating high user traffic; Magento is worth taking a serious look at. It’s by far the most robust, powerful shopping cart solution, but (understandably) expect hosting and development/design costs to be substantially higher. OpenCart: If you’re a small-to-medium business and looking for a well designed/coded, secure, powerful and fast-loading alternative that’s quicker to get up and running: OpenCart is your cake.